On Sunday evening, October 21, 2018, Eleanor Frances Peedin McFatter, 81, of Pikeville, moved to her Heavenly home. Jesus, the angels and a host of family and friends were there to welcome her home. Frances was born in Wayne County on March 13, 1937 to the late Henry Clarence Peedin and Addie Stafford Peedin. She was the eighth of nine children. 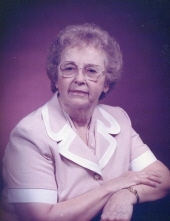 Frances graduated from Pikeville High School in 1955 and from Crumpler’s Secretarial School in 1956. That same year she married James McFatter. Frances was a longtime member of Pikes Crossroads Pentecostal Holiness Church in Pikeville. She was devoted to her church, served as a deacon, taught Sunday school and was involved in many activities where she utilized her gifts and abilities to share the love of God. In 1993, Frances began working with the daycare at Faith Free Will Baptist Church and truly found the job of her dreams. She loved children and was affectionally called “Miss Frances” by many of the parents, co-workers and children. The family will receive friends on Thursday, October 25, 2018 from 6:00 – 7:00 p.m. at Seymour Funeral Home followed by a service to celebrate her Christian life at 7:00 p.m. in the chapel with Rev. Jimmy Whitfield and Rev. Tom Dorman officiating. Interment will be on Friday, October 26, 2018 at 10:00 a.m. in Evergreen Memorial Cemetery. At other times, the family will be at their home in Pikeville. Frances is survived by her devoted husband of 62 years, James William McFatter; her son and the apple of her eye, Gary McFatter and wife Joni; grandsons, Blake McFatter and wife Rhea and Jamie Shearer and wife Laura; and great-grandchildren, Walker and Livi. She is also survived by her brother, Raymond Peedin of Raleigh; sister, Margaret Hollowell and husband Jimmy of Goldsboro; and several nieces and nephews she loved very much. In addition to her parents, Frances was preceded in death by her brothers, Fletcher Peedin, Herman Peedin, and Jesse Clarence Peedin; and sisters, Hazel Bizzell and Mary Ruth Tilton. Flowers are welcome or memorials may be made to Pikes Crossroads Church, 2494 Pikeville-Princeton Road, Pikeville, NC 27863 or to Kitty Askins Hospice Center, 107 Handley Park Court, Goldsboro, NC 27534. To send flowers or a remembrance gift to the family of Frances Peedin McFatter, please visit our Tribute Store. "Email Address" would like to share the life celebration of Frances Peedin McFatter. Click on the "link" to go to share a favorite memory or leave a condolence message for the family.